Flat-screen Eastern Counties RLE864 has arrived at the BusWorks for a complete restoration to NBC poppy red and white express livery. 864 had a long life with Eastern Counties, being delivered in 1970 and finally being withdrawn in 1988 by 'Cambus'. 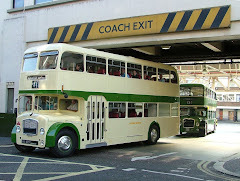 But 864 then passed to Citybus in Belfast for use as a driver trainer, returning to the UK for preservation in 1990. After several owners in preservation, RLE864 was acquired by Julian Patterson of Konectbus fame. 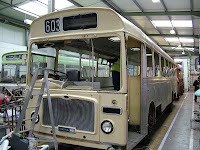 Julian has commissioned the BusWorks to undertake a thorough restoration including engine & gearbox overhaul, new cream glazing rubbers, refurbished interior, external repanelling and a complete repaint.